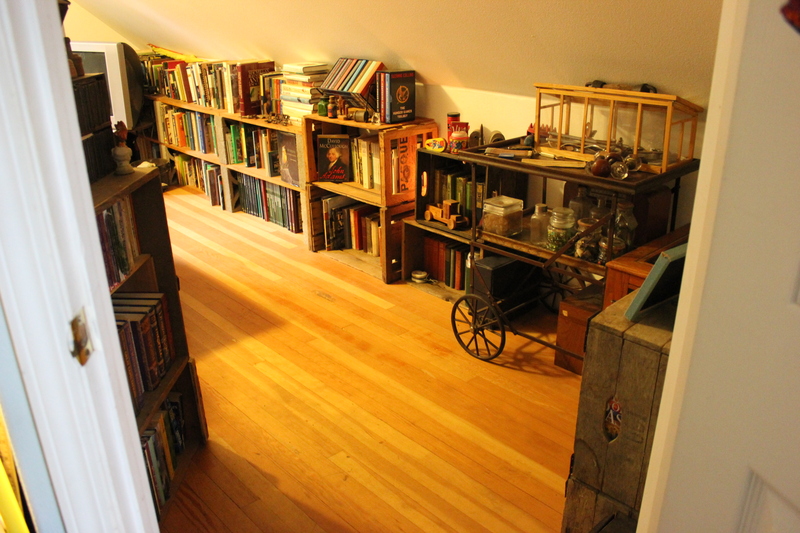 If you follow my blog, you may remember that I recently sorted all our books and redid all of our bookcases. Then I went to Nevada and retrieved my inheritance. Aiyiyi… I still have three boxes unpacked! I have: Reader’s Digest “classic” books, paperback mysteries, childhood Scholastic books, history books, a vintage animal encyclopedia set, vintage field guides, and just plain vintage books. Lots and lots of vintage books. Brenda Starr, Girl Reporter; the Curly Tops; Emerson; Shakespeare; the Bobbsey Twins; childhood nursery rhymes; vintage Forestry books (and that’s just what I have unpacked). PIPPI! Books illustrated by Sam Savitt! ALL of my favorite Scholastic prizes! Did I mention I still have three more boxes to unpack, all bankers box size? There’s no way that I will get to these any time soon as summer is nearly upon us and the heat index is rising for this weekend (too hot to be working in the loft – I will be doing something outside in the shade)! BOOKS! All that READING. Classics! The House of Seven Gables. Poetry. Cheap mysteries! Tom Clancy. BOOKS!! Um, can you tell that I’m a bit of a bibliophile? I hoard books. I can’t part with books. There are books in there about the exploration of the Great Basin. I am on a “de-clutter, deep-clean, get control of my life” kick. So far, I’ve powered through the laundry room, the bathroom, the kitchen and dining rooms. I purchased a shelf for our antique bottles, but I have not yet installed it. I got side-tracked with the upstairs. 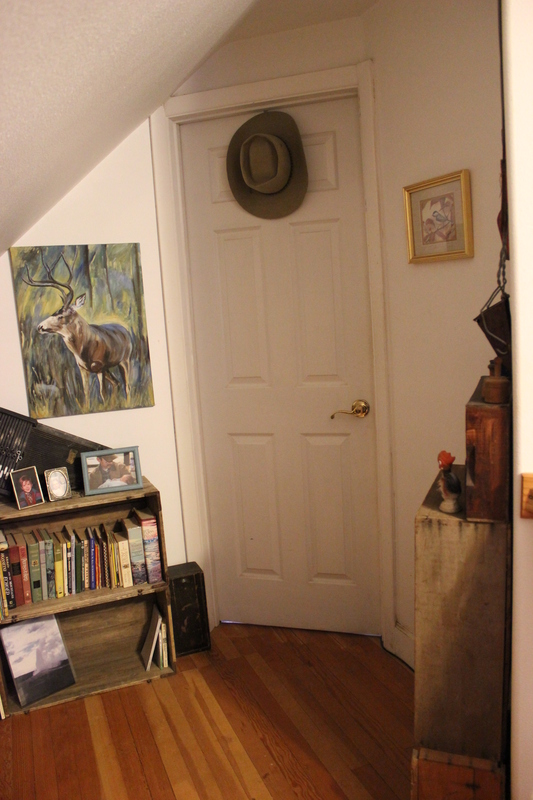 I need to get the upstairs whipped into shape before warm weather comes, because we don’t have air conditioning and it can get a mite bit stuffy up there, despite the window fans. 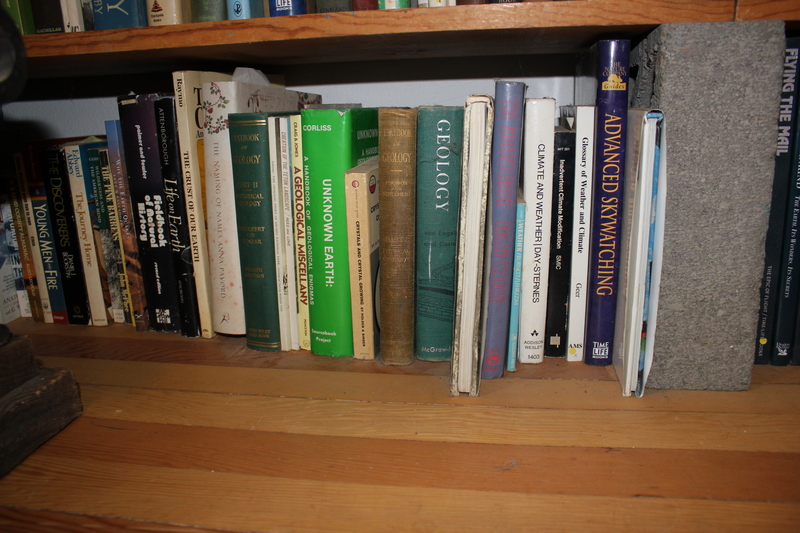 My first attack was the area where the majority of our books are stored – some of which have not been touched in the 12 years that we have lived here, except for a cursory dusting. The books were on the shelves in the same order they were placed when we moved in, which may or may not have been entirely logical. 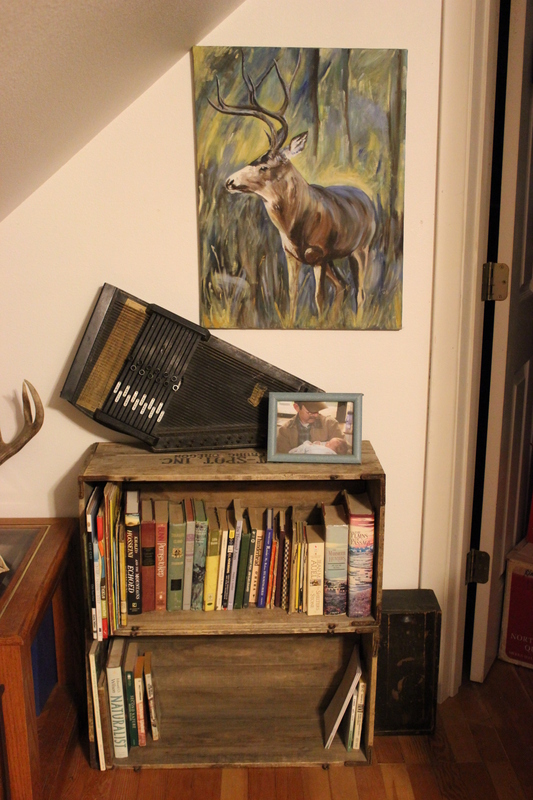 I decided that I needed to consult the Dewey Decimal System and get some sort of organization done, as well as moving the shelves out a bit and lining both sides of the area with book shelves (vintage crates, for the most part). That way, I could also get the antique pump out of the way of the shelving and on display as it rightly should be. The pump weighs a couple hundred pounds or so. It used to sit in the alley behind one of our first rentals, an old dredge pump that someone once offered us money for, but we decided we wanted to use it as a (very heavy) coffee table. Don added the stand and the table top. 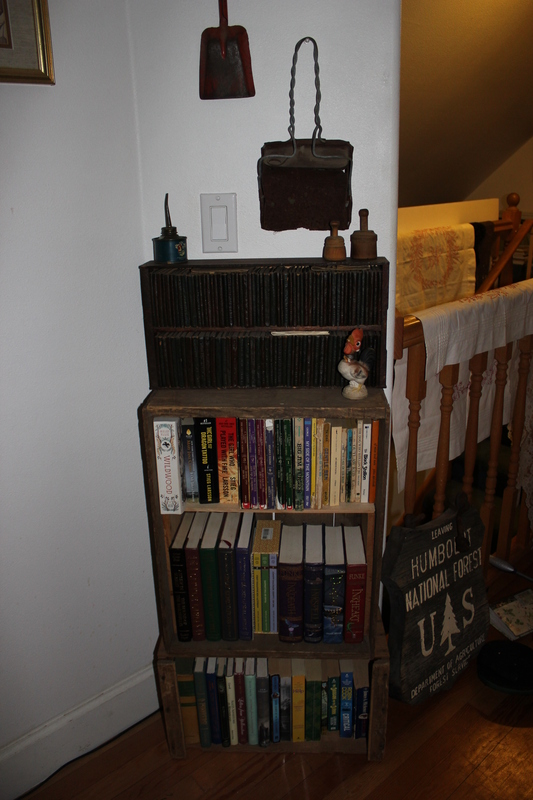 It no longer matched our living room area (which is tiny, like the rest of this house), so it was relegated to a corner in the loft, in front of the books. This project has taken me just over a week. I pulled out books and book shelves, dusted, swept, mopped. I found no silverfish, which surprised me because I know we have them, and I thought if they would hide anywhere, it would be in the books. I found some spider evidence, but not really much of that, either. But to be safe, I dusted the edge of the walls where they meet the softwoods with a light powdering of diatomaceous earth. Then I printed off an abbreviated Dewey Decimal System, because the majority of our books are not fiction, but are within .099 and 970.0 in the library catalog. I piled the books in loose piles according to their category. I didn’t move the fiction or the vintage books (although I confess some of Don’s vintage books got filed in with their modern counterparts. My vintage collection stayed together). Yes, we have a his and hers vintage book collection. The fiction is entirely mine. 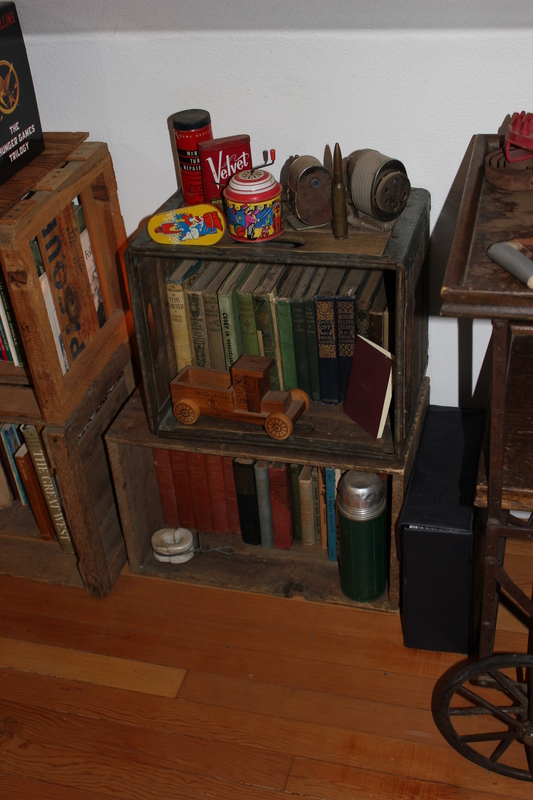 The vintage and a mix of fiction complete these crates. History, biographies, and Native American culture round it out. The majority of my fiction is here, in the narrow space by the studio door. I really don’t know what to do with the vintage Pepsi crates (at this point in time). My hands hurt (arthritis). Surprisingly, I didn’t tweak my back. Surprisingly, I’m done. Well, mostly. There’s a whole other side of the loft to do & a question of where to put the file cabinet blocking the shelves at one end of the loft. But I didn’t take a photo of that. I won’t label the shelves with the Dewey Decimal System, either. I still need to go back and file alphabetically by last name of the author, but – hey, we’ve lived without it being that organized for more than a couple decades. As long as we know the general area to find a book, we’re good. I had to sneak them into the house tonight. 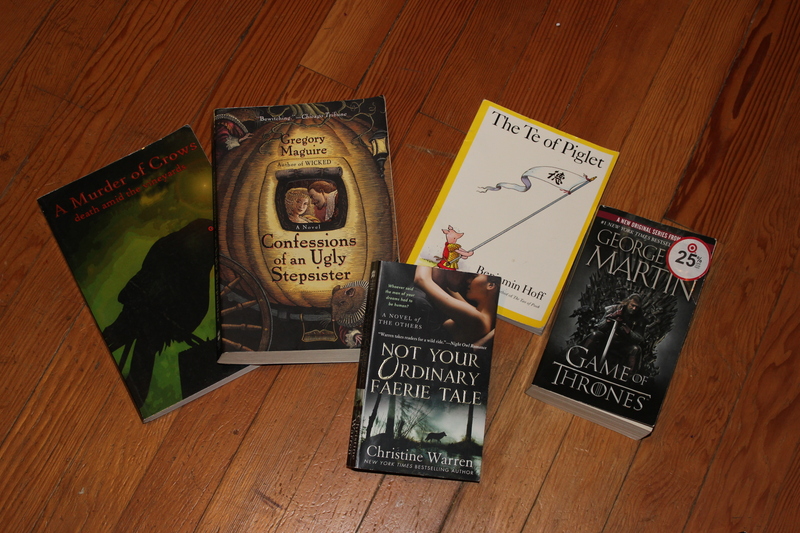 It’s not like I bought a lot of them – only five – but the fact remains: I just bought more books. They had a used book sale at work today. Lots of Ann Rice and Clive Cussler, some hard bound and some paperbacks. Quite a few that I have already read or <ahem> already own. Suzanne Collins’ The Hunger Games trilogy (I’m anxiously waiting for the November 21 release of Part 1 of Mockingjay). I own the books already. Khaled Hosseini’s A Thousand Splendid Suns, which is my favorite of his. I don’t own it, but I didn’t buy it: I convinced my coworker that she needed to. It’s intense. Kathryn Stockett’s The Help.It’s good, but it isn’t as stark a reality as it should have been, nothing like the reality in the above-mentioned books. It’s almost sugar-coated, but you fall in love with the characters so quickly – who can hate it? I own it already. I’ve even read some of the Ann Rice and Clive Cussler books, although they are not writers in my preferred genres. There were three of Stieg Larsson’s Books: The Girl With the Dragon Tattoo (not really my style, but I couldn’t put it down when I read it), The Girl Who Played With Fire (I’m not sure I can finish this one. I’m stalled in the first ten chapters. I like Lisbeth, and she’s headed down a dangerous path. Larsson doesn’t hold back in details and I’m not sure I can stomach the details), and The Girl Who Kicked the Hornet’s Nest (I have been told that if I can get through the middle book, this one is good. It’s getting through the middle book that is holding me up). I own the first two; I opted out of the third one simply because I think I should finish the second one. Some day. Still, I found five books. Kate Ayers – A Murder of Crows (death amid the vineyards). Never heard of it, but it looks like a mystery. Set in Oregon, and it has a reference to one of my favorite birds. How can I lose? And if I lose, I’ll package it with the Christmas stuff and send it to my daughter in Alaska. Gregory Maguire – Confessions of an Ugly Stepsister. Remember the author? He wrote Wicked. I’ve never seen the musical, but I have heard it is excellent. I can’t say that for the book: there’s an entire chapter that could be lost and noone would be poorer for it. I just hope Ugly Stepsister doesn’t contain one of those chapters. I liked his writing style in Wicked. 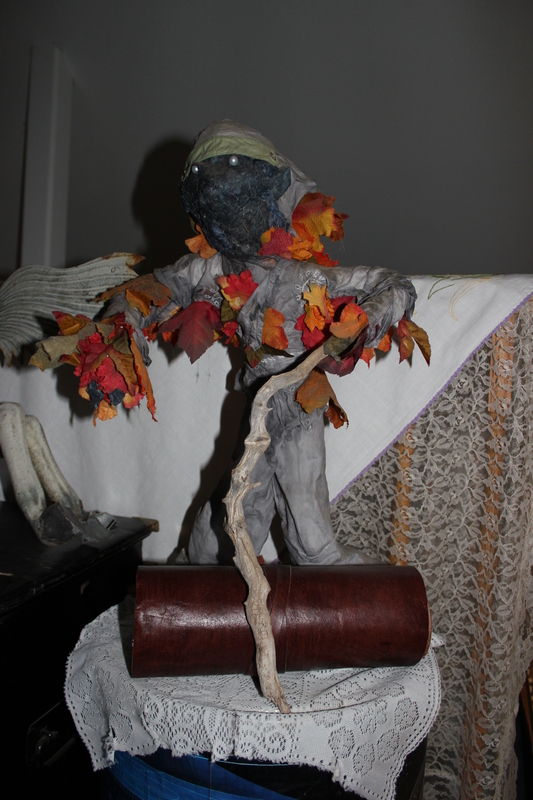 Christine Warren – Not Your Ordinary Faerie Tale. Romance, sci-fi, mystery. Cheap paperback. I’m in. Benjamin Hoff – The Te of Piglet. No, I don’t know why I picked this up. I’ve never read The Tao of Pooh. It looks funny. And wise. Something I can read while waiting for a doctor or dentist or other such appointment. I can become wiser while waiting. How can I lose? George R. Martin – Game of Thrones. I’ll save it for last because once I open those pages, I’ll be lost until I have finished the book. Then I will have to do a marathon streaming of the HBO series. Before I can star on any of this deliciousness, I have to finish at least one of the four books I am currently reading. Donna Tartt – The Goldfinch. The jury is still out on this one, but at least we have survived the adolescence of the hero and he is now a young adult. It keeps me sane on the long commutes home. I think – because the hero is not sane. He’s very disturbed. But I like Hobie & Pippa, and so I can’t quit listening until I know what happens to them. Harriet Beecher Stowe – Uncle Tom’s Cabin. I was listening to it, but I found that I made more sense of it in print. Unfortunately, it is not as gripping as I had hoped and I’ve allowed Uncle Tom to grow dust. I do intend to finish it. Jeff Gunhus – Jack Templar and the Monster Hunter Academy. This is really adolescent fantasy and quite funny reading. Don’t take it seriously. It is currently my waiting room reading material. 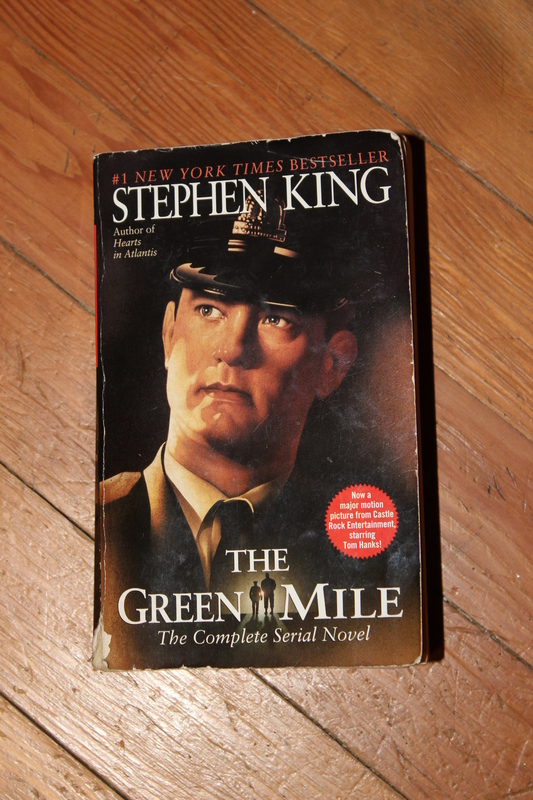 It is also Book#2, so – yes – I read Book#1. John Muntean & Jo Walker – Willing to Die. True life history, written by a friend of mine and dictated by a survivor of Communist Russia. It’s dry history sprinkled with anecdotes and photographs, and dire parallels to certain current events. I’m only about a third of the way in because I tend to prefer fiction to non-fiction. Oh – and I have to read this before I can start on my new books, because not only did I buy five books at work today, but another co-worker just finished this and remembered that I had asked to borrow it. So I need to read it and return it before I can enjoy my purchases. I made no headway in de-cluttering. Seriously, I have a hard time parting with things. But I did a heck of a job cleaning & organizing. I just wish it didn’t wear me out so much. The loft is our library. I have never counted how many books we own and they’re only semi-organized into groups. There are more books downstairs and in my studio, and more in the boxes I packed at my father’s house in 2011 and left in storage. 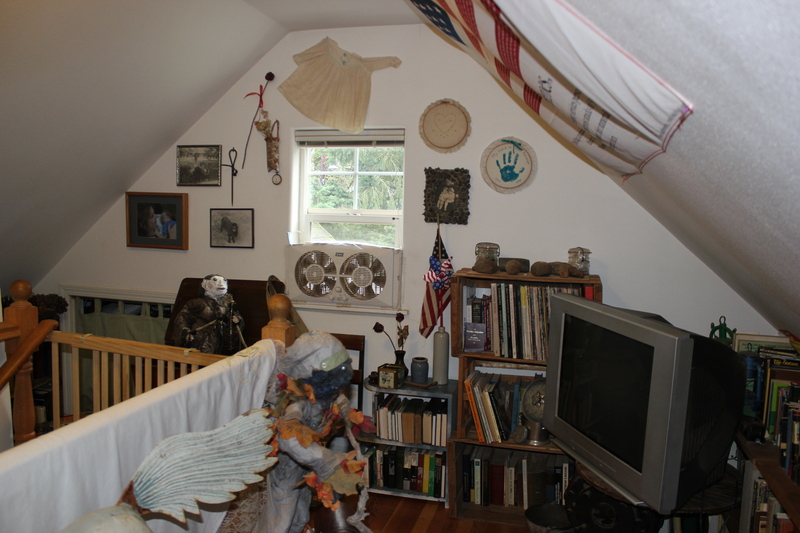 There are more books in the left-hand corner of the photo (out of sight). I tried to group things so when I do have the time and energy, and that television is gone, I can sit down with a copy of the Dewey Decimal System and organize the books. No, I am not going to number the shelves, nor am I going to try to catalog what we own. 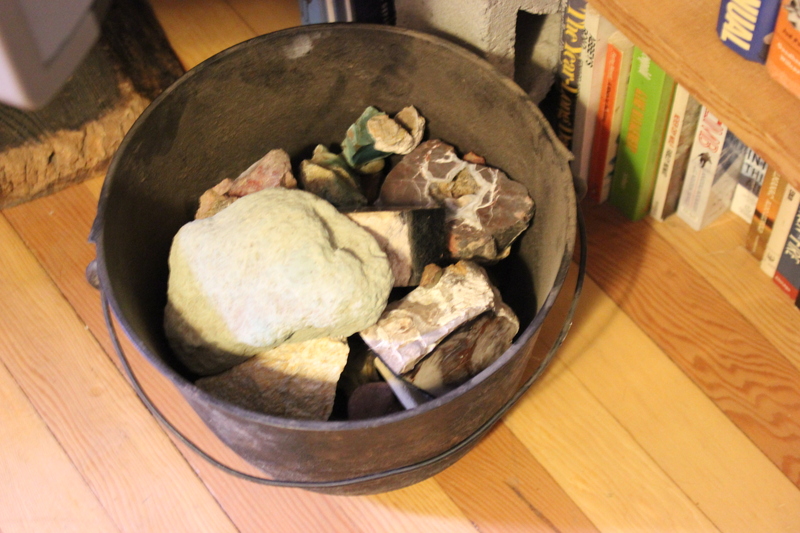 Yes, that is a cauldron full of rocks. No, I don’t know what I am going to do with those rocks. I hate to throw rocks out where the moss and mildew consume their natural beauty, know what I mean? OK, so you don’t know what I mean. It’s just hard to part with rocks. I’ve pared it down to this bucket. 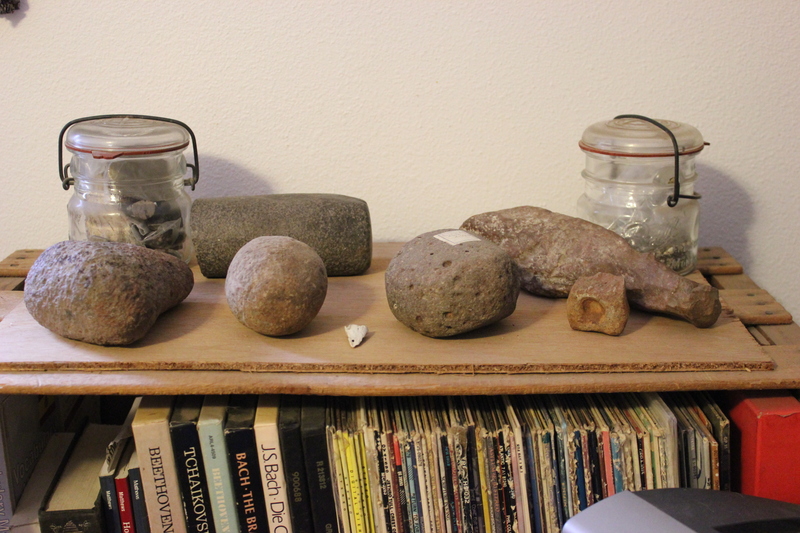 These are rocks, too, but at some point in time, a human being formed, chiseled, and used these rocks until they wore down to fit the hand that wielded them: grinding stones of different sizes and shapes and one coup stick. I try not to think of the heads the coup stick was used on. 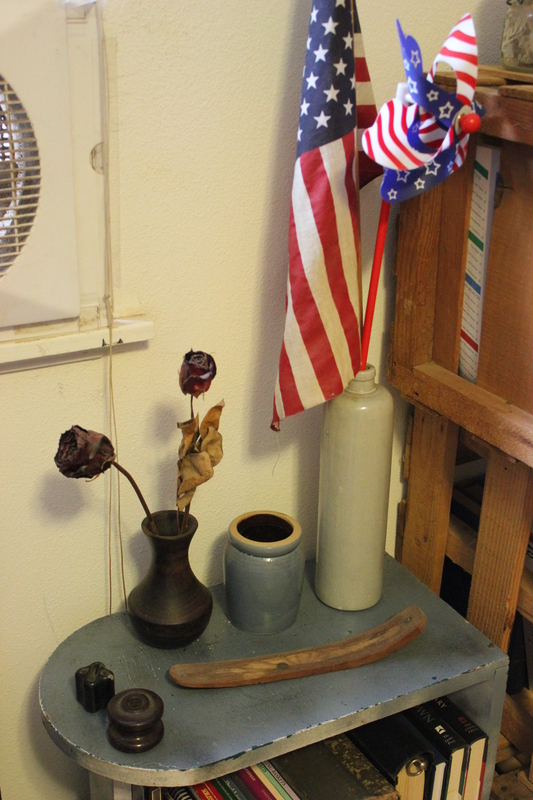 Old pottery and insulators. We have a lot of old insulators. We do not have a lot of old pottery. That bookcase seeds to be stripped and repainted. I’ve been hauling it around for more than 30 years, it has been painted 3 times and never stripped, and the paint is peeling. I tell you: I hate to part with anything practical, even if it is presently ugly. Pewter. 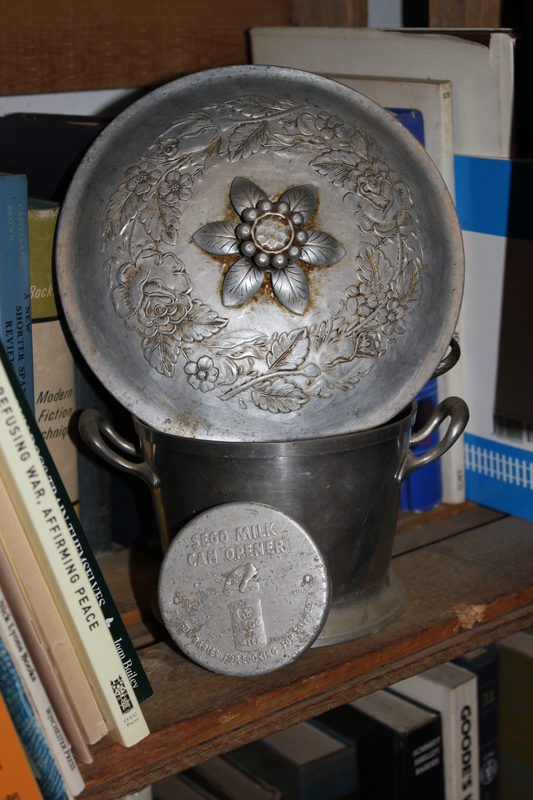 The pewter lid in the bottom of the photo is actually a can opener for canned milk. On the flip side, there are two sharp points for indenting the can of milk. The ornate lid at the top is an anomaly. I wish I had the entire pewter set. That lid is ornate and beautiful. Ignore the horse. It’s a project. I need to get some galvanized tine & try to beat out new forelegs for it. I have one of the legs for a pattern. It is *not* an antique, anyway, but a replica. No, the treasure here is the trunk. In Scotland, Phillip was born. 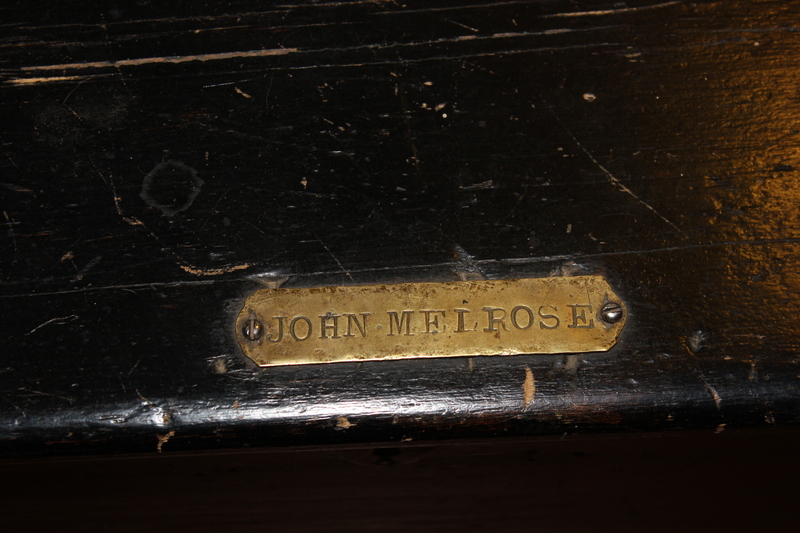 He married and in 1826, John was born. John came to America. He married and in 1861, Phillip was born. Phillip married and in 1901, John was born. John was my grandfather and he had no sons, only daughters. 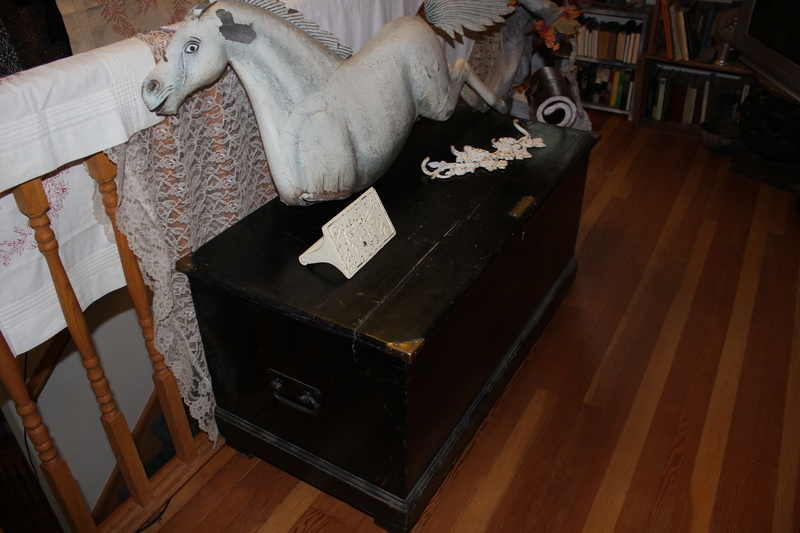 This trunk was my mother’s treasure and she passed it on to me, along with all of her genealogy work. I probably should take this down. It is hard to contemplate taking it down. The day is still raw in my memory. My son enlisted because of this day in history. This day in history is to my generation what December 7, 1941 was. The only difference between those days is that in 1941, the enemy not only declared himself, but took full credit. I’m not certain we will ever know who, exactly, was the enemy on 9/11/2001. But whoever the enemy was, a lot of heroes gave their lives on both dates. 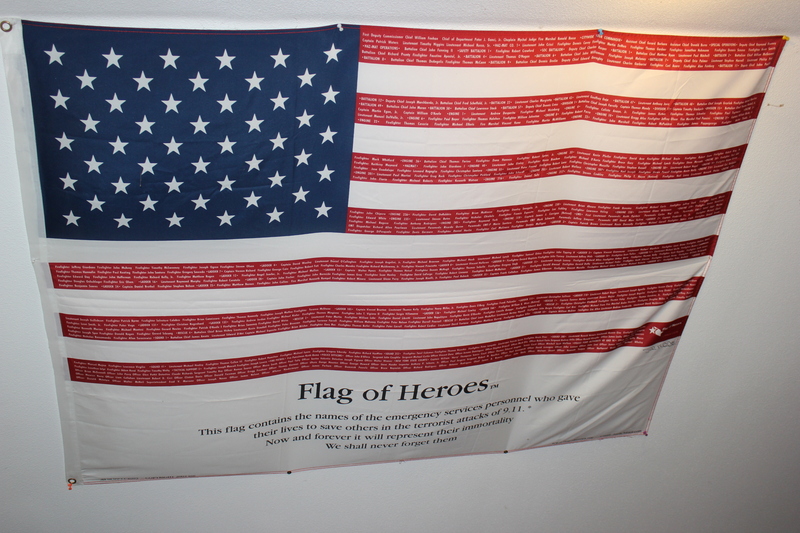 Some were soldiers and some were First Responders. It may be awhile before I can take this down, fold it up, and retire it. From left to right: Arwen, with newborn Javan. 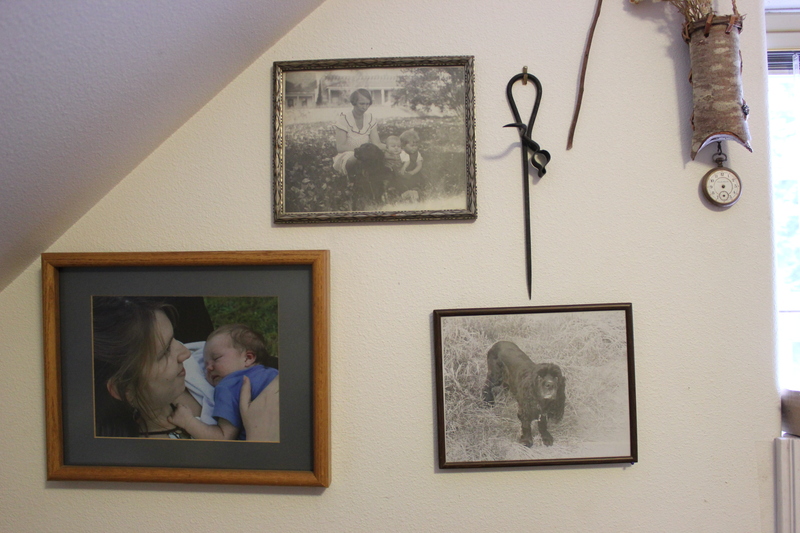 Above: Sylvia Cusick Wilcox with her two children, Mary & Jack, and a beloved family pet. Sylvia died within a year of this photo due to complications from the streptococcal bacteria. My dad believed – and I do, too – that she died of flesh-eating bacteria, the same as my little sister. Necrotizing faciitis. She died in Salt Lake City in 1930 and there are no longer any records. The dog in the last photo was someone’s beloved pup. I found the photo at a Goodwill store. He looks a little like my childhood pet, Butchey, but I think this dog is purebred Cocker Spaniel. He meant something to someone because they had his photo enlarged and framed, and probably hung it on their wall until they passed away and someone from the younger generation didn’t know who the dog was. So I bought the picture and I hang it on my wall because it reminds me that every generation has had at least one beloved pet that was worthy of a framed photo on a wall. Godot approves of my new arrangement upstairs. When the TV is moved out, I’ll be able to get better photos of the pump. 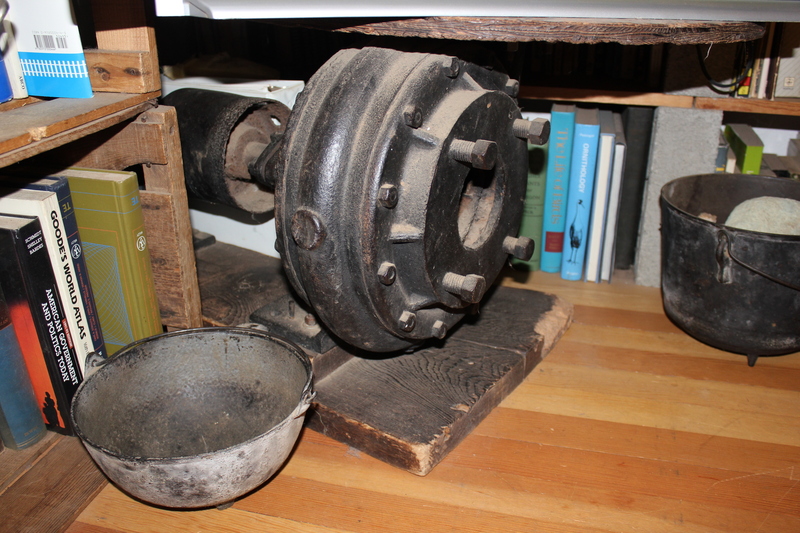 It’s an old water pump for use with a large dredging system. 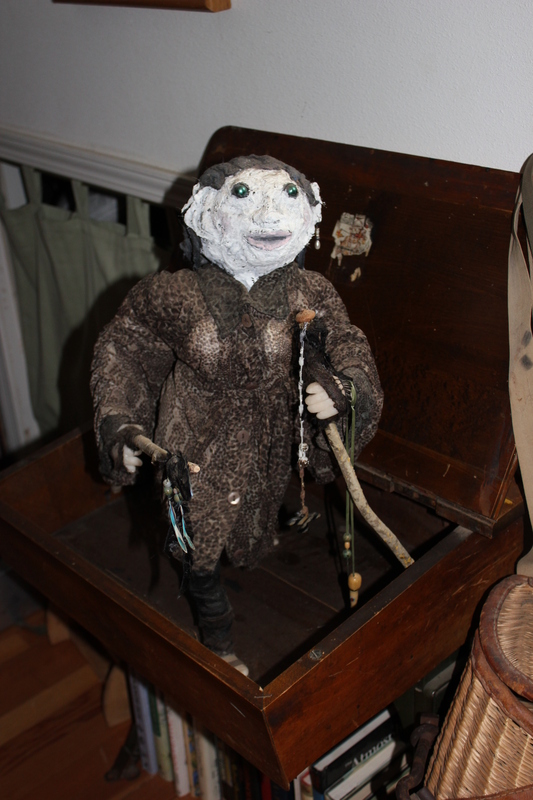 It sat in the alley behind a girlfriend’s house for decades. When Don & I rented the house, we cleaned up the property. Don converted the pump into a Very Heavy Coffee Table. It takes two men to lift it and move it. That pump is all cast iron. You wouldn’t believe the offers we’ve had on that monstrosity. The entry to my studio now looks pretty and clean. 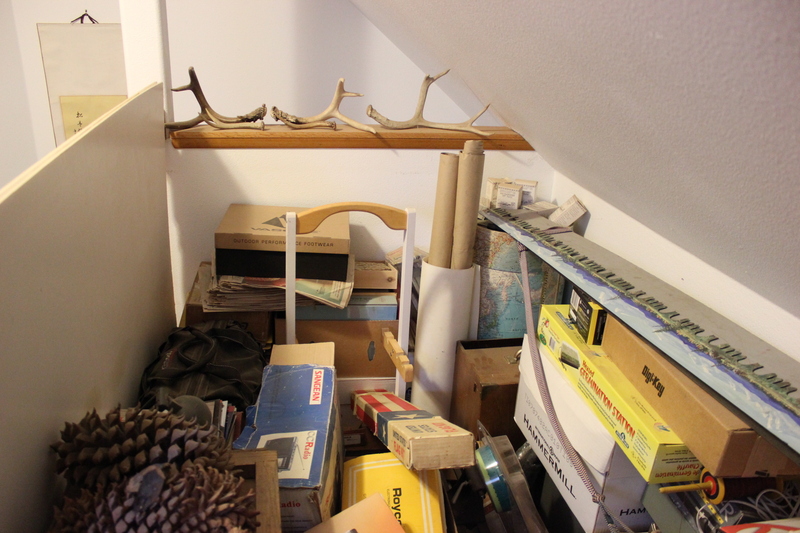 THIS is next weekend’s project: dealing with the clutter in the rest of the loft. I wasn’t up to this mess this weekend. This is going to require storage boxes and serious decluttering. Wish me luck. (No animals were harmed in the collection of those antlers. They are all shed antlers). The End. Or: The End until I bring the rest of the books home and I sit down and organize the books. That’s a scary thought. I spent today working on one of my New Year’s Resolutions: decluttering. Actually, it went more like rearranging, but I’m working on the casting off of stuff. Really. I started in the loft. I figure if I can get this area under control, the rest of the house should be easy. 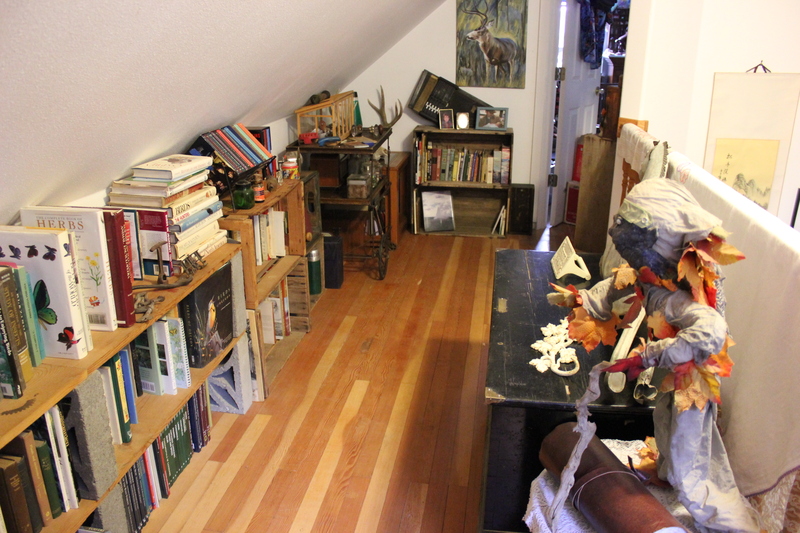 I ignore the loft more than I do the rest of the house because I don’t have to live in the loft – I just walk through on my way to my studio or on my way to the stairs to return to the main level. I am in no means ready to declare a victory. That’s only a partial view of what I have left to do. So many books, so few bookshelves. I put two books in the Yard Sale Pile. The boxed collection of Misty by Marguerite Henry (Okay, that’s four books right there) and The Casual Vacancy by J,K, Rowling. The former is simply too juvenile for my collection although I love Marguerite Henry (and I still may retrieve it). The latter is… well: did anyone like it? I never made it through the first chapter. Maybe I associate J.K. Rowling with the brilliance that is Harry Potter. This book isn’t that. 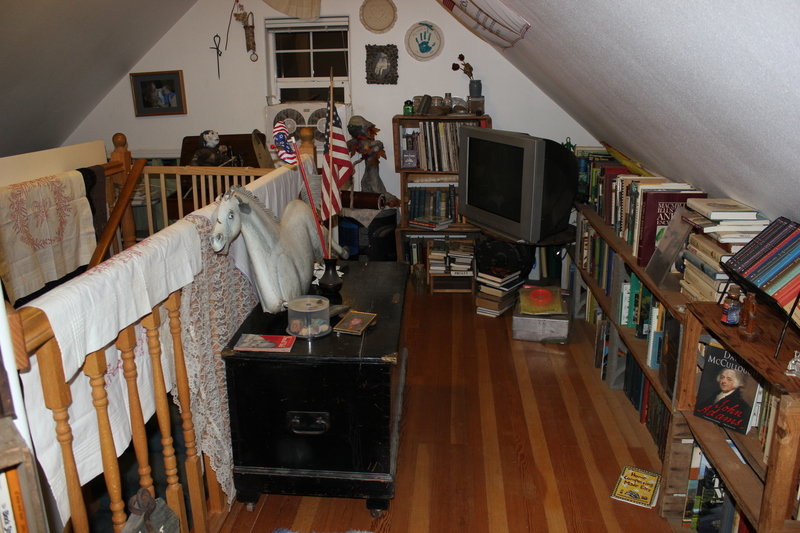 The loft is a strange space with very little room. I fit a narrow set of crates here by the light switch. Ignore everything around the books: things may be moved in the future. My great-grandmother’s leather-bound collection of Classics sits on top in it’s own box – everything from Wadsworth to Shakespeare to Arabian Nights. This is all fiction. 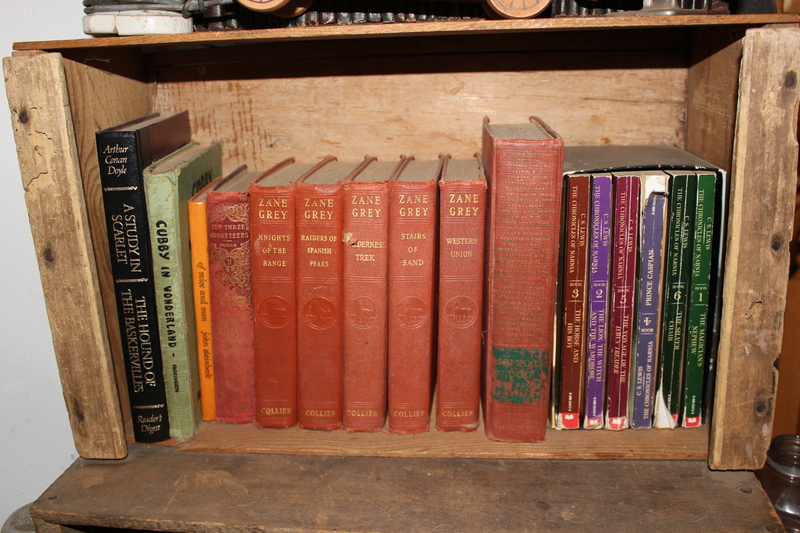 Many of my antique books are right here now, with a few antique or collectible items (all the crates are collectibles). That thermos? It’;s original and has never been broken. Serious. It has the glass lining. I haven’t added all the books to this corner – more fiction. Arwen’s autoharp that my dad gave her. My little sister bought it at some antique sale and gave it to my mother. My dad passed it on to my oldest. We tried to have it tuned when she first got it, but the Internet (as we know it now) did not exist and we couldn’t find anyone who knew anything about autoharps. Now, you can just google it and all sorts of hits come up. Some day, I hope my daughter will take it and learn how to tune and play it. It may be warped, however, and maybe will never hold a tune. My father & his older sister. 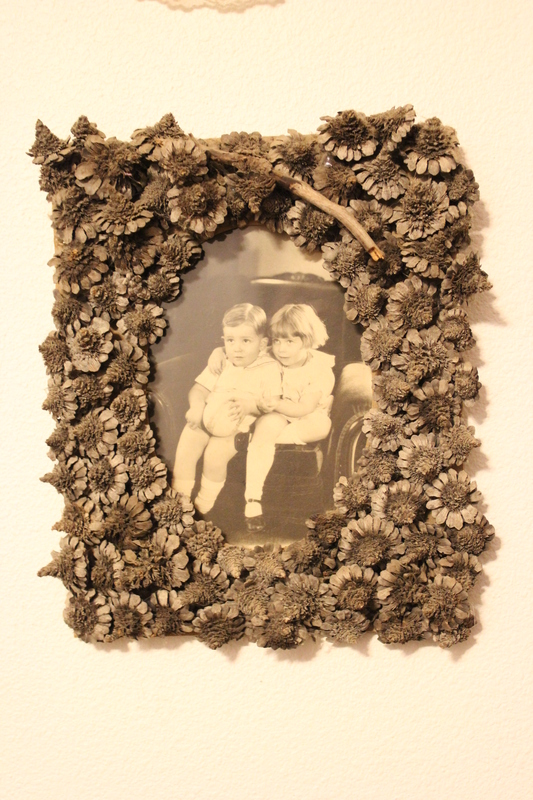 I created the frame with fir cones. My dad was probably 2 and his sister was a year older – the year his mother died. 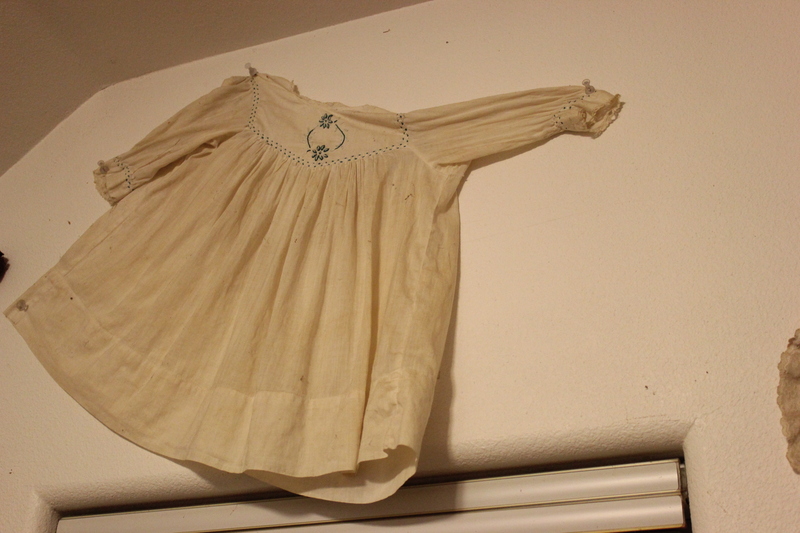 I’m not sure who this belonged to, but it was worn by some family member. The heart was created by my dear friend, Janie, when I was pregnant with my very first child. It’s so classic of her talent. 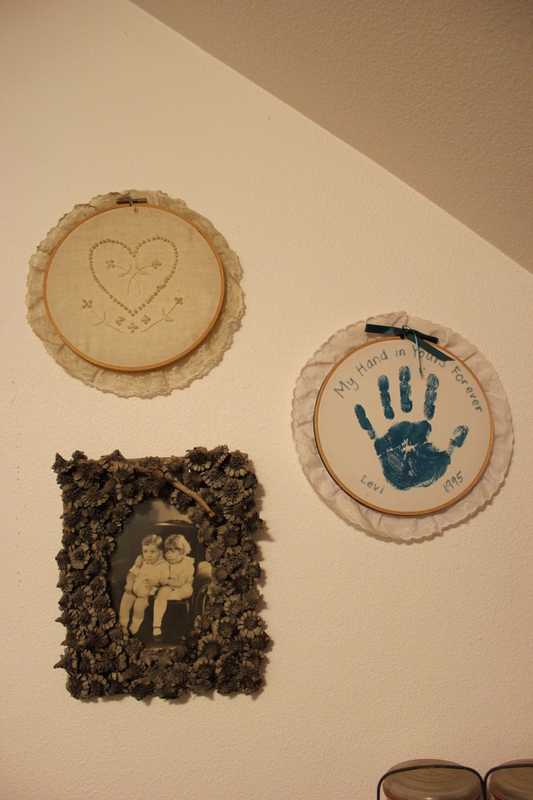 Levi’s hand print in 1995 goes so well with the embroidered heart. This is the reason for this post. No, not the Lava Lamp (although that one is a classic). 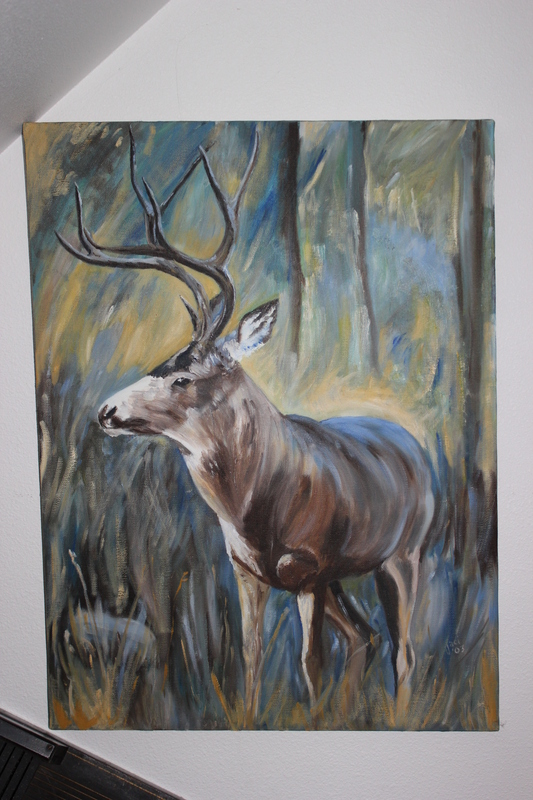 The trophy buck is the reason. Back up to the lamp. 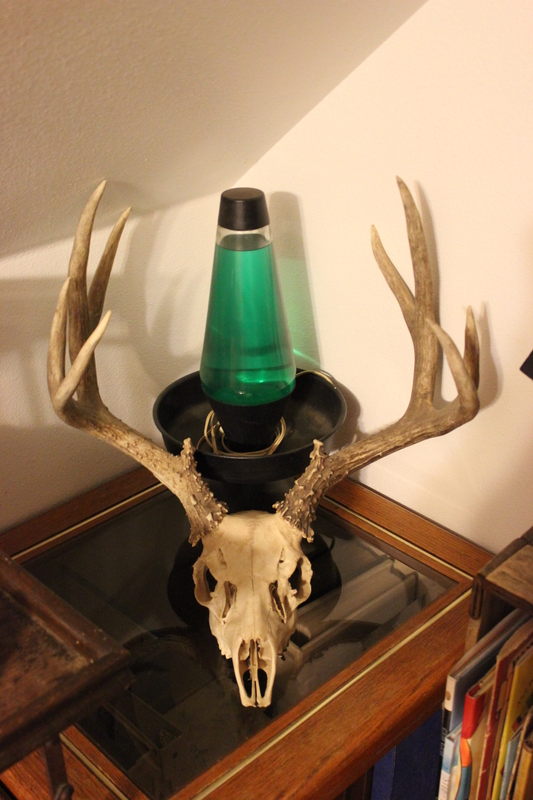 A friend had the lamp in his possession. It was 1960’s weird. I repainted the base to basic black (possibly ruining any collector’s value of an original 1960’s Lava Lamp that still works). It’s great. If I were to plug it in, it’s totally 1960’s Lava Lamp weird. I just want you to know that. But that rack! It’s a black-tail. Four point, by western standards. 8-point by eastern. Symmetrical. “Just a Quarter Mile Hike Lake” – yeah. Right. Straight up a freaking cliff. And when we got there, we discovered there was a spur road down to within a couple hundred yards of the lake. Some day I will tall that tale. In later years, we referred to the spot as “Mossy Rock” because there is a rock slide of ancient history that is covered in a deep carpet of soft mosses. The whole area is deep ravines, pristine creeks, rock slides, boulders, small lakes filled with small trout and salamanders, and native plants all around. A lot of good memories. One year when Don & I camped there, we were playing in the deep forest and boulders, down-fall, and moss. We came across a skeleton of a deer. It was intact, only a little disturbance by mice and rodents. 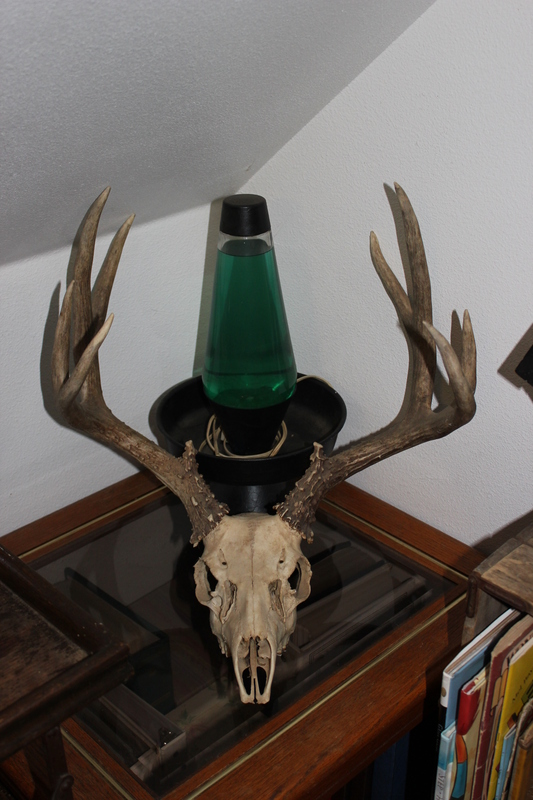 The head is what we brought home: that perfect four-point black tail buck. We don’t know how he died. But his skull was our gift. He must have been beautiful. I had this grand plan when I got out of bed this morning: today I was going to tackle the books that are stored in the loft. I was going to get a handle on the genres of fiction and the non-fiction subjects. Somehow, I was going to tame the un-tameable. I got up the stairs and stared at the book cases lining the wall. Then I retreated back down the stairs where I armed myself with more caffeine, a dust mop, a ceiling duster thingie-ma-bob, a can of dusting spray. I returned to the top of the stairs. I decided I needed to put away the loose books first, finding space for them in the general location of the same subjects. Only there were no gaps where there needed to be gaps and I ended up stuffing the loose books where ever they would fit. I reasoned that once I figured out what my subject categories would be, I could start moving the books around to the right book case. I removed all obstacles. This is a feat in itself because not only are there books on the bookcases and in the crates, I have old bottles, rocks, an old lava lamp, more rocks, more old bottles, marbles and large pine cones also stored on the shelves. It’s a magpie’s treasure trove. I could get rid of the rocks. No, I can’t. I collected half of those rocks. Half of them were collected by Don. There are pieces of jade, picture rock, sandstone, agates, petrified somethings, petrified wood, obsidian, arrowheads, coup clubs, grinding stones, gill net anchors, and a myriad of other little stones picked up along a wooded path. Pretties. I stuffed the loose books into the gaps in the book cases. I swept, dust mopped, and knocked cobwebs off the ceiling. The ceiling has nothing to do with the books, it’s just that periodically I need to knock cobwebs down or we start to look like a haunted house. Then I surveyed my handiwork. I was still overwhelmed and nowhere near my goal of figuring out the subjects of most of our books. How am I going to separate these into subjects? Antique Maps, Touring Nevada, Physical Geography, Fifteen Decisive Battles (!? 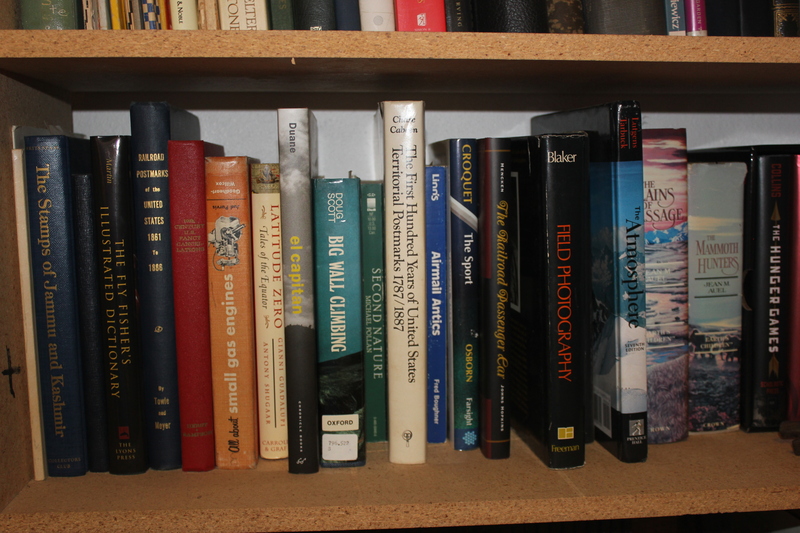 ), Irish Wit & Wisdom, and several books on Native Americans. This shelf gets more interesting: Big Wall Climbing, some philatelic titles like Airmail Antics, Small Gas Engines, Croquet the Sport, and some Jean Auel novels. Like all those belong on one shelf. Although I think I can safely say that Ayla, the character in the Jean Auel novels, probably invented everything from postmarks to stamps to small gas engines. Personally, I never got beyond The Valley of the Horses before I got bored with Ayla’s obvious brilliance and her insatiable capacity for orgasms. But, hey, if you’re a Jean Auel fan, no offense meant. She can write in minute detail. Really. Minute. Detail. My favorite part in all the books I read was when Ayla invented a comb to tame her matted hair. That was after she befriended the lion and escaped from the Neanderthals and gave birth (by herself) to her child and before she met the heart-stoppingly handsome (and virile) Jondalar. Fast forward to the end of another shelf. Bird books. 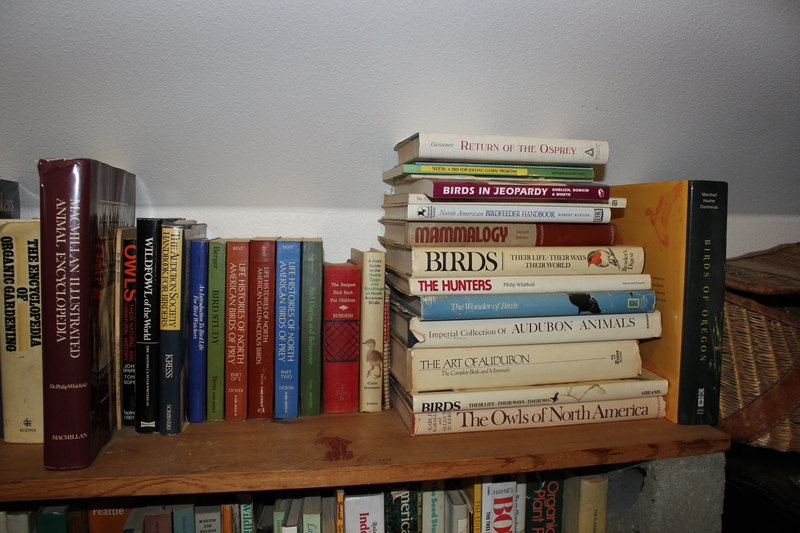 Lots and lots of bird books. 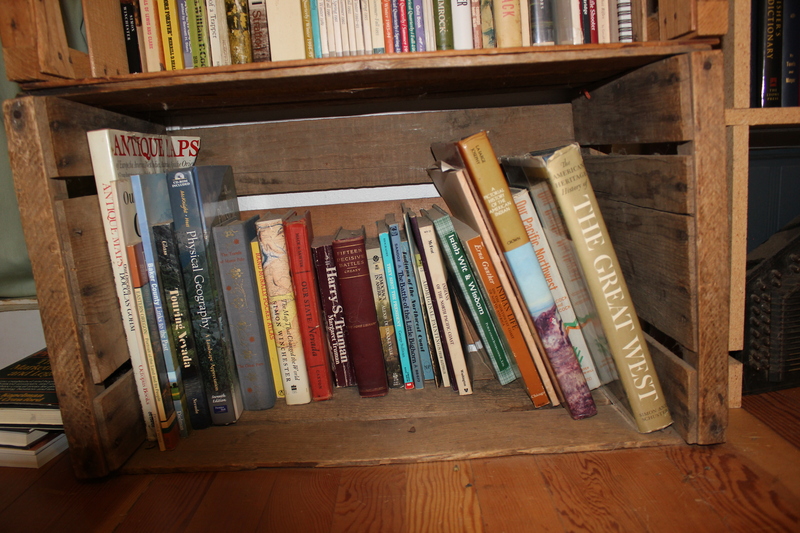 Tucked in there is the Burgess Bird Book for Children by none other than Thornton W. Burgess. If you have never opened one of Thornton W. Burgess‘ delightful children’s books, this is a good one to start with. What is really cool is that I did not know there was a Thornton W. Burgess Foundation until exactly 30 seconds ago when I googled his name for a reference for this blog. I grew up on Burgess’ writing. When my son discovered reading was fun and that he could read chapter books, he read every Thornton W. Burgess book at Lake Oswego Public Library. Ecclectic would be a good word to use around here. Books like Young Men & Fire by Norman MacLean, The Journey Home by Edward Abbey and The Pine Barrens by John McPhee are filed with books about geology, Into Thin Air by Jonathon Krakauer and The Naming of Names which is about plant taxonomy. Field guides are stuffed alongside more Norman MacLean, Roadside Geology, Ancient Inventions, Butterflies, and The World of Harvester Ants. I kid you not: the ant book was a hard one to find but one my husband wanted for Christmas one year. Then there are my private bookshelves where my books are not comingled with Donald’s decidedly non-fiction tastes (in case you haven’t guessed it already, 99% of the non-fiction titles belong to my husband although the history books have a slightly better ratio of ownership). I didn’t tell her I only have five Zane Gray. Cubby In Wonderland was the first chapter book my dad ever read. It has great plates of Yellowstone in the 1910’s. 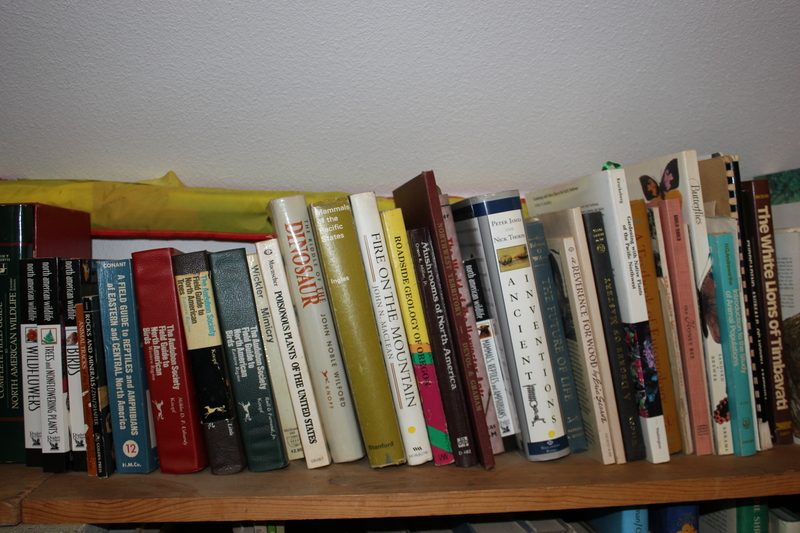 Poetry… Just a few of my poetry books. And old books. I love old, old, old books. I tried to count the books but got muddled somewhere around 200. I decided the best thing to do was data enter them into an Excel program and sort them later. I still have all those books in boxes in Reno. And the books on the bookshelf next to my bed. And the books next to my computer. And the books in the living room. Which brings me to one of my shelves. And if you have survived this long in my blog about books, I commend you. The next shelf hardly represents my collection. In the insanity of insanities that is book collecting, I collect Bibles. 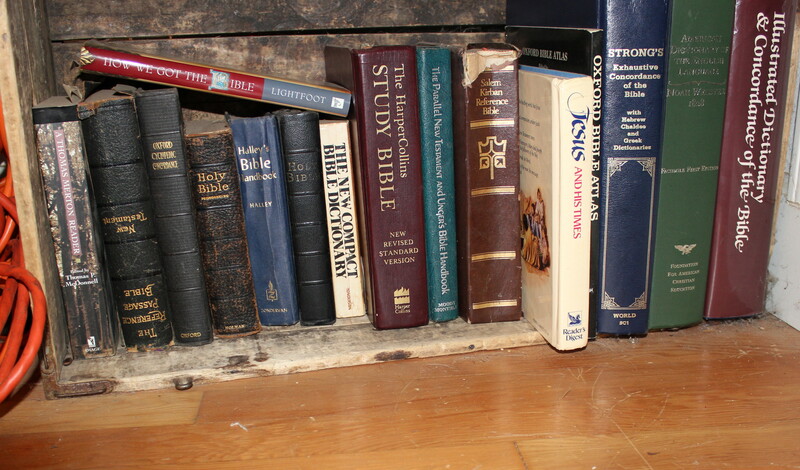 Nearly all of the Bibles are mine. A few are Don’s. Okay, maybe two are his. The rest are mine. There are no less than four on the shelf above this one, two in the book case next to my computer, one (or maybe two) in my car, and at least two in my bedroom. While the rest of the world struggles with King James English, most of my Bibles are in the same language Jesus spoke in: King James English. Thought I better insert that before some rabid KJV-hater jumped on me. I just happen to like KJV. I also have: Revised Standard Version (the Methodist Bible), New International Version, New King James, The Living Bible, a Parallel Bible, and probably something else. I have a Thompson Reference and two Scofield Reference Versions (my favorite Bible). I have some that are New Testament only and a couple that include the Apocrypha (the Catholic version). It’s a weakness I have. I see an old Bible at an estate sale and I have to buy it. What’s $0.50? I get someone’s old Bible with their hand-written notes. It’s my favorite book. KJV, of course. But don’t worry: I’m currently working my way through a library collection of books. I’m rereading Harry Potter. I have decided I need to buy Harry Potter to add to my collection. So if the Bible scared you off, Harry Potter should bring you back. Or visa-versa since I know Christians who are terrified of Harry Potter. It’s a book. A very inventive book where Good Triumphs. Which is why it belongs in my collection. So – aside from the side notes and ramblings on the Bible and The Children of the Earth series, HOW am I going to organize all of this??? Books! Books! Oh, for the Love of Books! I am sitting here in Ely, Nevada, sorting through the remnants of my father’s life. It is not exciting: it is strange and eerily without spirit. I thought I might feel his spirit when I walked in the front door a couple days ago, but there’s nothing. He’s not here. He left his memories of my mom, but she hasn’t been here for 16 years. The will has been executed and only a few things were actually itemized, so it has been up to my brother and I as to how things are to be divided. My sister’s oldest is acting in her stead and sharing in the division of the household good; he inherits the house. Depressing stuff but stuff that must be done. There are moments of joy. Funny photographs, the discovery of some item my father was certain had been lost or stolen but which had merely been misplaced, finding my costume from my 4th grade tap-dance debut (we did the cha-cha and it was absolutely embarrassing). One thing that was spelled out in my father’s will was the dispensing of the books. I get first pick of all the books. It’s overwhelming.Sadly, some of my childhood books were long gone: the old Wizard of Oz books by L. Frank Baum and Billy Whiskers series by Frances Trego Montgomery. Today, I braved the outside shed with all the black widows and hobo spiders. We did set off a bug bomb in there, but with all the stuff and leaks, I wasn’t certain all the spiders would be dead (they weren’t but I didn’t see any widows or brown recluses, just a hornet and a tiny white spider). My goal was simply to throw away everything useless so that when my brother arrives from Reno tomorrow, we have an easier task of it. There really isn’t anything in that shed I want, so it will be divided between my nephew and my brother. I moved a crate and stared at five cardboard boxes sitting on the floor, taped and labeled. BOOKS. BILLY WHISKERS. I actually felt the presence of my father for a moment and heard his amused chuckle. He knew the books were there. He wanted me to find them. I have sorted through them and am only keeping two boxes of them. There were so many old friends in those boxes: paperbacks I saved for and bought through Scholastic Books at school. 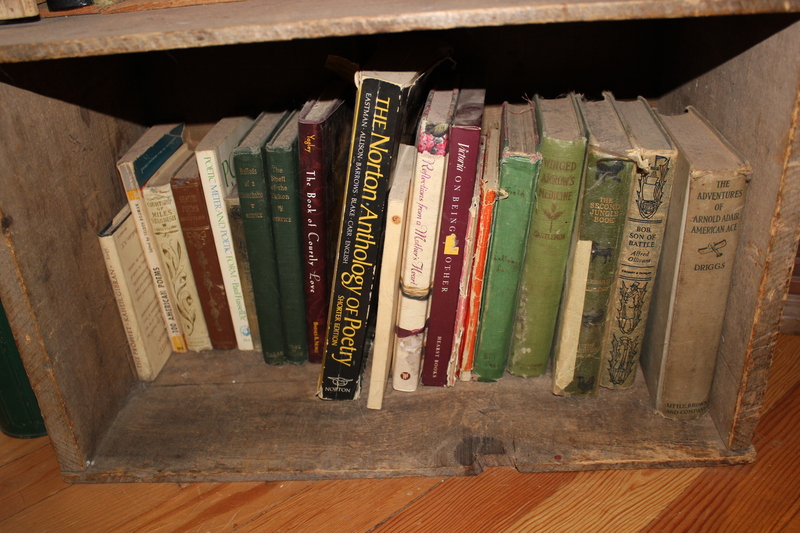 There were books that belonged to my mother, to my grandmother and some that belonged to my great grandmother. I found three books of the Bobbsey Twins. Shakespeare, Milton, DeFoe and more. Books, books, books! And most of them in good condition. Sadly, the Billy Whiskers books are in sad shape and one has no cover at all to it anymore. I only found the insides of Ozma of Oz and none of the other Oz books. I’ll have to recover them but since they have already lost any value they had when they lost their covers, that is perfectly fine. I will still have the words. I can scarcely wait to get reacquainted with that recalcitrant old goat, Billy Whiskers! I think I found my own little piece of heaven today. I miss my dad but I will always have him near as long as I have all those books to read and re-read!